The only road trip we've been on lately is to the vet, which we hope we don't need to do again any time soon. However, now that Mom Paula is retired, she wants to work with us on harness/leash training and traveling with her on future trips. 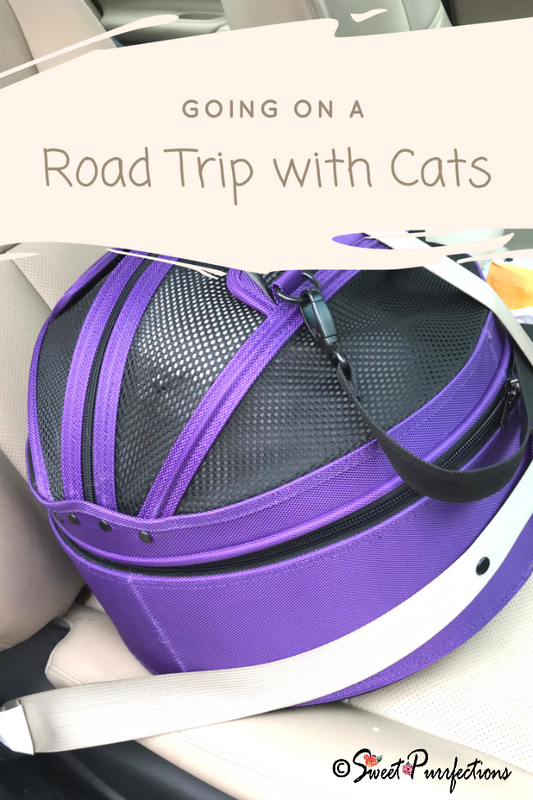 Since we haven't been on any road trips of any distance, we've reached out to one of our cat blogging friends, Jeanne, from Random Feline for tips and experiences when traveling on the road with cats. Mom Paula originally met Jeanne at BlogPaws four years ago and was impressed that Jeanne brought along a few foster kittens. Each year since then, she's had kittens with her (to the joy of every cat lover at the conference). 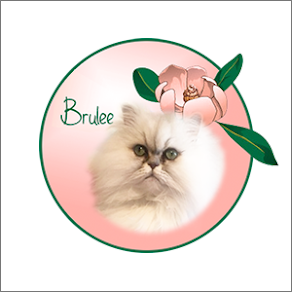 This year, Jeanne chose to bring one of her own cats, Chanel, whose siblings were at BlogPaws last year as a kitten and now has a forever home with Jeanne. Jeanne shared her preparation tips in an earlier blog post. We hope you learn as much from our interview with Jeanne as we did. What order do you pack the car and how do you decide where to put the cat carrier? 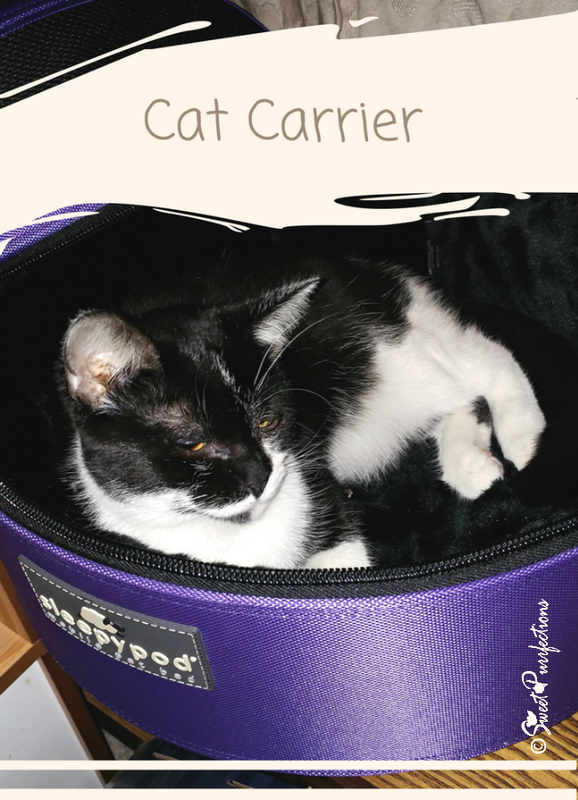 I've recently received a Sleepypod® Mobile Pet Bed and I feel very comfortable with the safety of this carrier when traveling with my cats. I like having the carrier up front with me. That way I can see her and she can see me while we drive. With the seatbelt system, I feel safe with her up there and my car has a safety system that the airbag won't turn on unless there is a specific weight in the seat and she doesn't trigger that. I place a crate in the backseat on the passenger side - again so I can see her. Do you use a carrier, a crate, or both? For short trips, I just use the carrier. For longer trips, I use both a carrier ad a crate. This really was the first time I have taken Chanel on a trip long than about 30 minutes, so I wasn't sure how long she would last in the carrier. She made it about 45 minutes before she decided she needed more space to move around. I took a break, got some breakfast, and moved her to the crate for the rest of the trip. I stopped about 30 miles from the hotel to move her back to the carrier so I didn't have to worry about that while at the hotel and trying to unpack the car. The first break we took was about an hour in so I could get something to eat and move Chanel to the crate. After that, I took breaks when I needed to stop for gas. Since Chanel did most of her traveling in the crate, she had access to a litter box and water dish. Every time we stopped, I gave her some treats to make it a positive experience. I thought about letting her out in the car while on breaks, but decided with my luck, she would get under a seat and I would spend time trying to coax her back out. Chanel isn't an "outdoors" kind of girl (haha), so staying in the car was fine with her. Many people ask me what I do with my cats if I need to stop to go to the human bathroom. This year I got lucky and the weather wasn't bad, so I felt okay leaving her in the crate in the car while I quickly took a restroom break. Normally, I wait until I have to stop for gas, then do everything at once. Last year when traveling with the kittens, it was much warmer outside. I would turn up the air conditioning in the car to cool it down, then run into a gas station or rest area. I did put a sign on the crate that year that said "we are OK, our mom just had to pee" in the hopes of keeping someone with good intentions from breaking a car window. I suppose I could have put them in their carrier and taken them inside, but I don't want to be "that" person breaking the rules. If it had been any warmer, I would have reconsidering taking them with me. What's the maximum amount of time you travel in one day? I did the full trip in one shot - about 10 hours per the map. However, there was an accident in Indiana, so it ended up taking about 11 hours to get to Kansas City. It took about the same amount of time traveling back home, because I stopped more often. Honestly, Chanel did well enough that I think I could travel that long again with her. If any longer and we had to drive, I would break it into a two day trip. 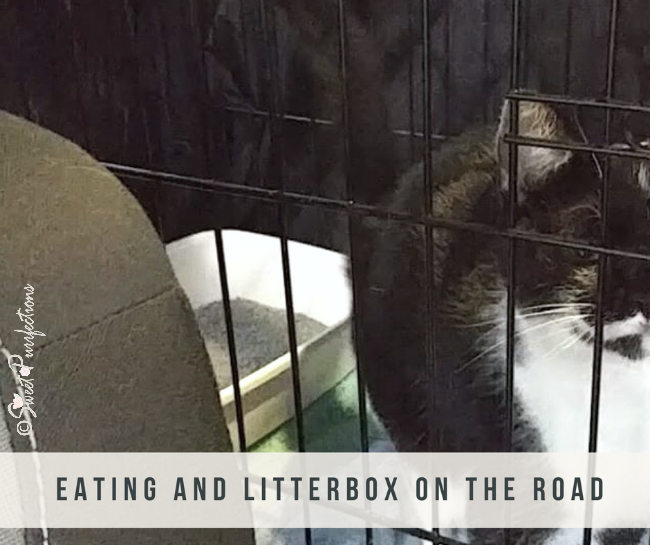 Where and when do you provide food, water, and the litter box while traveling? That is the nice thing about using the crate. I can have a litter box set up and I have a water dish I can attach to the crate side so it won't spill. I just gave Chanel a few pieces of food or treats every time we stopped for a break. It really is about patience and knowing your cat. I wasn't sure how Chanel would do on a trip of this length or in the Sleepypod for any length of time. I made sure I paid attention to her and what she was doing or how she was acting. If at any time I thought she was really stressed, I would have either stopped overnight or figured out something else for her. We want to thank Jeanne for taking the time to share her experiences while traveling on a long road trip with Chanel for the first time. 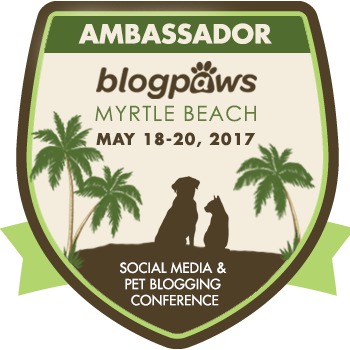 Visit us next week when we talk to Jeanne about staying in a hotel room and moving about during the BlogPaws conference. 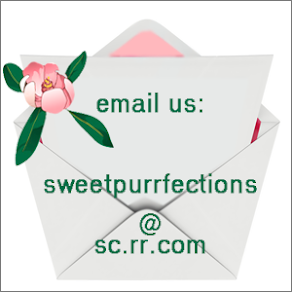 Have you traveled a long distance with your cat(s)? If so, please share your experiences and tips in the comments. I prefer flying trips to car trips, so if the destination is more than three hours driving time, I fly. I've done all day driving trips with my human, but they are draining for us both. When I went to Vegas and a couple of shows up north, my human did set up an enclosure with a litter box for me (which I used! ), but I was not happy. I'd much rather be at an airport, entertaining people! My human has a pact with me to never leave me in the car. So she always brings me in for bathroom breaks, and only goes to drive throughs to eat if she gets hungry before our destination. 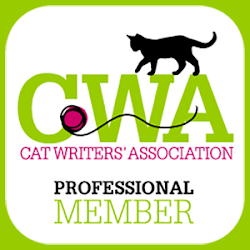 Great tips - da longest momma's travelled wif a cat recently is bout 4 hours, but da peeps did move cross-country with one multiple times decades ago. Car trips must be a challenge for any cat owner. Our Dustyloved to travel but most of the others do not. I regularly travel with up to 5 of mine since we show. My little black Persian is my master traveler. Plush and I have been from Maine to Virginia, several times to Pennsylvania and everywhere in between. I've only done about 3 hours with all 5. It is harder with multitudes. When it is just Plush and I, or Plush, Treeno and I, then I pop up my show shelter in the back seat, belt it in and let them be. They have a box and I put in food and water but normally no one eats on the road. I usually have someone else with me on really long trips so we take turns staying in the car and running into the rest stops and we only eat at drive through or carryout places (which really limits the choices!) Plush likes to come out and "drive" when it is dark out but obviously I only let him do that if I have someone with me to mind him. One of my others likes to sleep on the dash (again only if her minder is with me!) We're going to Cleveland in the fall, that's going to be the longest trip we've done. I'm going to have to break it up for me not the cat, he'll be fine but there's no way I can do 14 hours in one shot! Really interesting interview...Thanks! I can't imagine traveling with cats, especially the shy and fearful ones I've always adopted!! I've only ever traveled with cats when I was moving house or country. I used a regular pet carrier, airline approved. I put pee pads in, a blanket and a plastic container for water that I tie wrapped to the crate door so airline staff could refill the bowl, because they aren't allowed to open the door. One cat did fly with me in the cabin and she did very well, didn't make a sound. I really should get me one of those, even though my road trips end up at the Vet too! 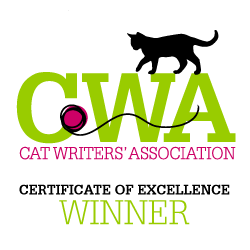 We love reading about cats taking trips! We only go to the vet, bit wr always learn things from others p.s. mommy loved meeting Chanel! Great rundown of travel tips. I loved this! Really helpful to see how someone has done this successfully, thanks. I have never traveled with a cat. I have three dogs that go everywhere with me. 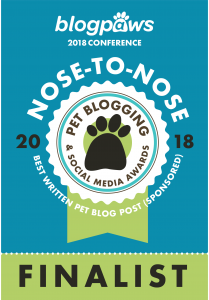 We traveled to BlogPaws last year and drove 14 hours to get there. Of course, we gave ourselves plenty of time and stopped for the night three times along the way. They are great little travelers! These are great traveling tips. 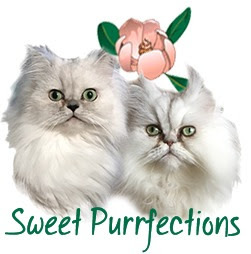 Great tips although I do not have cats it is always good to learn just in case. I have not taken Layla on a long trip yet but hopefully in the near future we will be able to do it. I think the next time I have to take Ricky to the vet, I will try using a crate with litter box. Until now, I have used a carrier. The trip always ends the same: a soiled towel, a cat in need of a bath, and me, gagging and gasping for fresh air. And that's a return deal (both ends). Thanks for the tips! 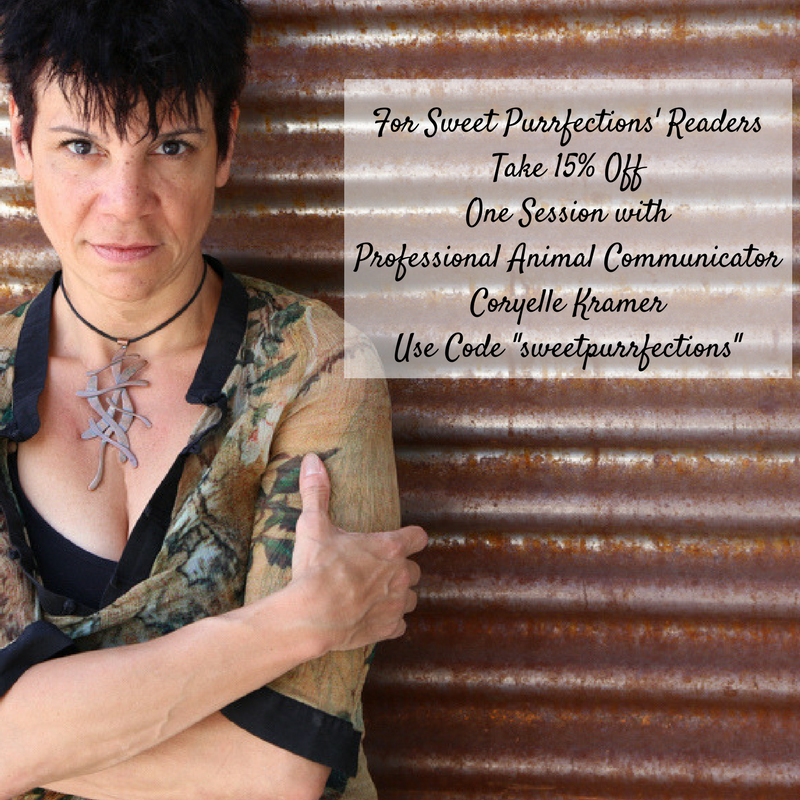 Awesome tips from Jeanne! 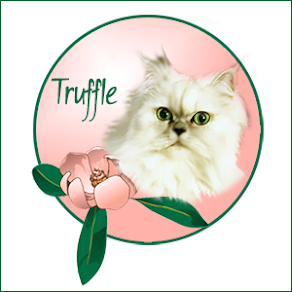 She & Chanel are veteran cat travellers. Great interview, thanks for sharing, I'm sharing too. Chanel is such a good girl! 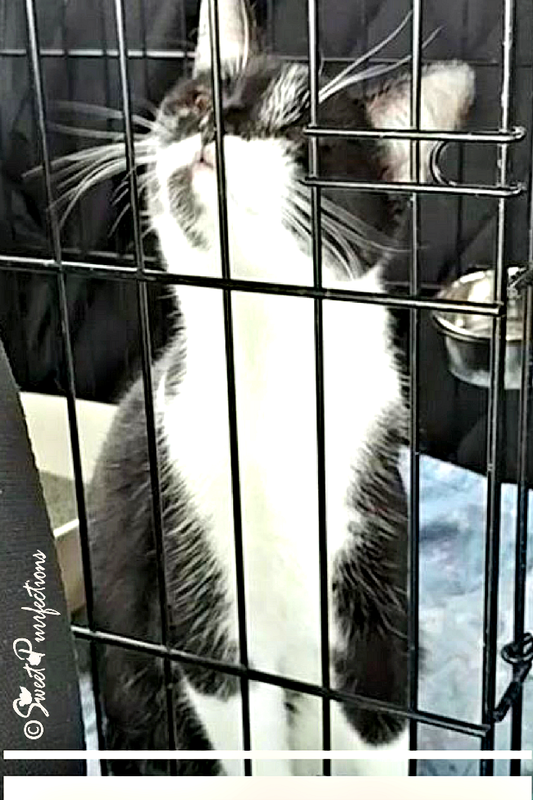 Cupcake's recent trip to BlogPaws was by far the longest she had gone in the carrier in a stretch, and she was quite ready to be out by the time she got to the hotel. The crate sounds like a nice way to give a cat a little more space for such a long ride. These are really great tips. When I moved from CA to MT I drove the 1,000+ miles by myself with three cats. I was prepared, but not nearly as much as I should have been. I learned the hard way that it is best to feed very lightly. Oh, and accidents will happen so be prepared! I like the idea of having both a crate and a carrier but I couldn't fit that into my car, especially with three cats. 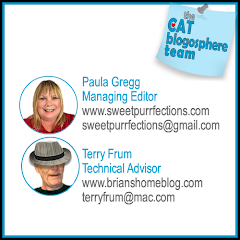 Thanks for sharing these tips and information about traveling with cats. We don’t travel much either, just to the vet. But sometimes the vet is an hour away...so these tips help. Fauna, after reading this my first thought was, what about the hotel room? Looks like I need to tune in next week...great minds think alike! These are some great tips. I have never traveled with a cat, but I can completely relate to the issues with the heat in the car when traveling alone with a pet. I have been in this situation a few times. I typically opt for the gas station as that is usually the quickest. We are talking to Jeanne (and perhaps others) about staying in a hotel room next week, so please come back. These are great tips and helpful for any new pet owner! Traveling with pets CAN be tricky at times. We moved from Florida to Virginia and drove with the pets and they seemed scared since they didn’t know what was going on! So I think taking breaks, giving them room to move around, and adding any favorite toys are very important!